Arlen Roth is one of the world’s most beloved and powerful guitarists. He was voted among the Top 50 All-time Acoustic Guitarists by Gibson.com; and Vintage Guitar Magazine has him in the Top 100 Most Influential guitarists of all-time. 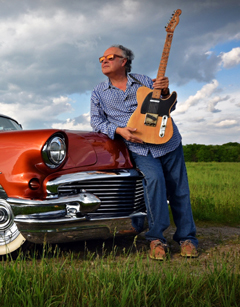 Known as the ‘Master of the Telecaster,” he has toured and recorded with the likes of Simon & Garfunkel, Bob Dylan, John Prine, Phoebe Snow, Steve Wariner, Steve Cropper, Eric Andersen, Tony Bird, Danny Gatton, Ry Cooder, Don Mclean, Janis Ian, The Bee Gees, Duane Eddy, Albert Lee, Brian Setzer and countless more. He is the founder and creator of Hot Licks Video, with 2.5 million customers worldwide, in which he pioneered taped musical instruction. He wrote the #1 voted column “Hot Guitar” for Guitar Player Magazine for 10 years, and has published eight best-selling books on the guitar. He has 16 solo albums to his credit, and many Grammy nominations. His latest solo acoustic album, “Paint it Black: Acoustic Stones,” has garnered rave reviews and he is currently working on the “Telemasters” album, which is a follow-up to his smash hit, “Slide Guitar Summit” album.